Vision slats in your door (above) allow natural light into your garage. Available with or without glazing. On textured woodgrain doors vision slats are supplied in a brown finish - £16 + VAT per linear metre. 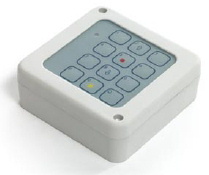 For our Standard and Compact automatic garage doors only the remote control key and pad provides you with a secure, alternative option for controlling your door. Suitable for external installation, this wireless controller offers convenience without compromising your security. 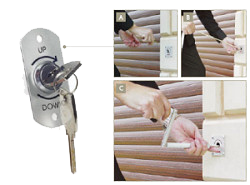 This kit is for our Standard and Compact automatic garage doors only. The low level external override kit enables the door to be opened manually in emergencies from both the inside and outside of the garage. If the garage door is the only means of entry you will require either the battery backup or the low level external override kit. If no pedestrian door available this enables door to be opened manually in emergencies. These override kits cost £186 + VAT. Specialist supplier of insulated automatic roller garage doors for DIY installation or with UK fitting service.